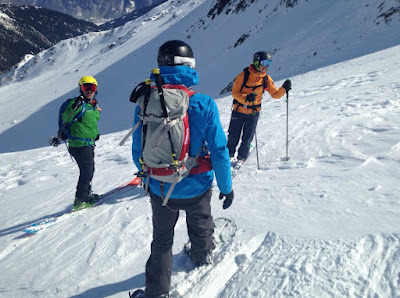 With the interest around our new much lighter and smaller 3.0 avalanche airbag system, interest in our light weight pack styles has increased. In particular, because the new 3.0 system packs are so much smaller and so much lighter than before, the Light Removable Airbag, a 30l pack designed for backcountry skiing and riding, has received some extra attention, and with that have come questions about what features it has. 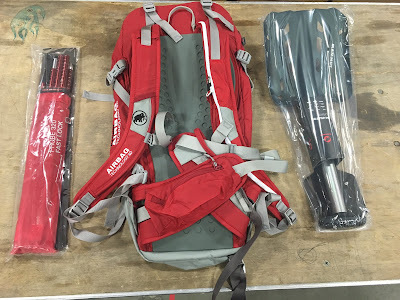 For anyone looking for info, here's a detailed look at this particular pack. 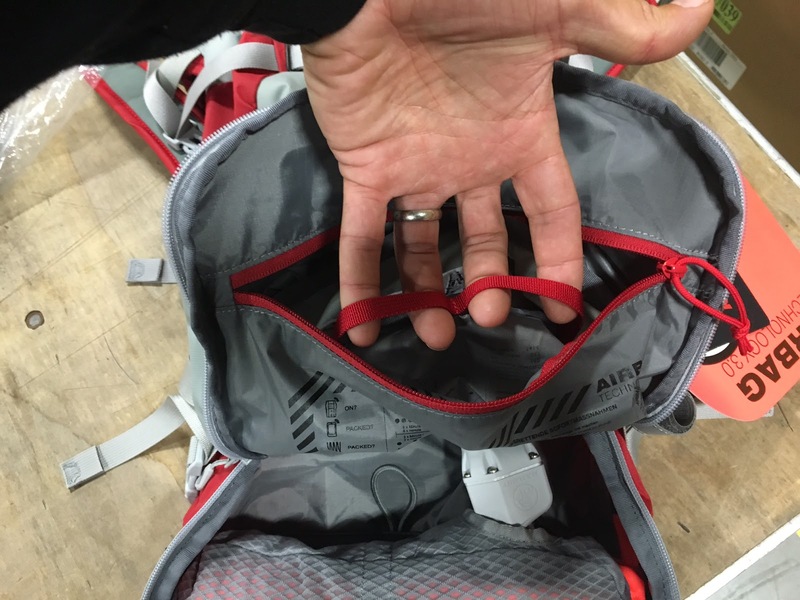 The Light Removable Airbag 3.0, here in use by split-boarder and Mammut product Manager Micha Vollmer in the Swiss alps, is as good a one-pack quiver as we have for lightweight backcountry tours. The new 3.0 airbag system has numerous benefits over the previous 2.0 version, all of which are spelled out in detail in my previous post on this blog (LINK). For a weight-conscious backcountry-only skier or rider, this is the one-pack quiver. The pack is redesigned from the previous version, and utilizes a zippered panel-access to the main compartment and is constructed of 100D/210D cordura nylon. This is a lightweight fabric with a very good durabiltiy-to-weight ratio. When sandwhiched between a shovel inside the pack and skis outside the pack even the heaviest fabrics will cut easily, but for general abrasion resistance and tears such as those encountered skiing in rock gullies and through brush, this fabric has surprisingly good durability. 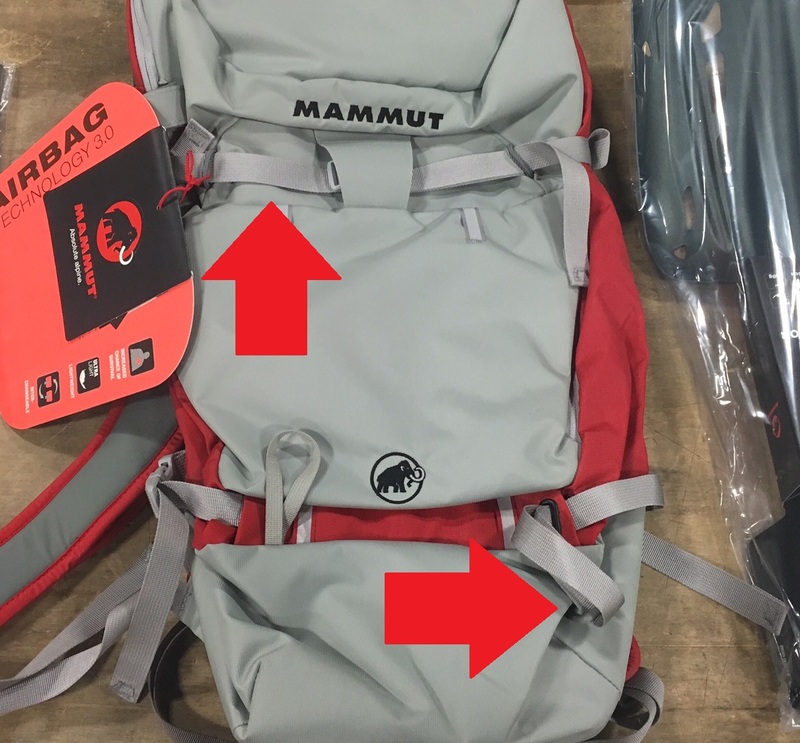 If, after a couple seasons of hard use, the pack is getting tired the removable airbag system allows simply replacing the pack itself and switching your airbag system into the new pack. It also allows buying a second "ready" pack (i.e. without an airbag included) in a different size in order to make your one airbag system more versatile. The pack has adjustable diagonal ski-carry straps or a snowboard can be carried with one additional strap supplied by the user. This system is light, functions easily and eliminates redundancy and the clutter of straps seen on so many backpacks. 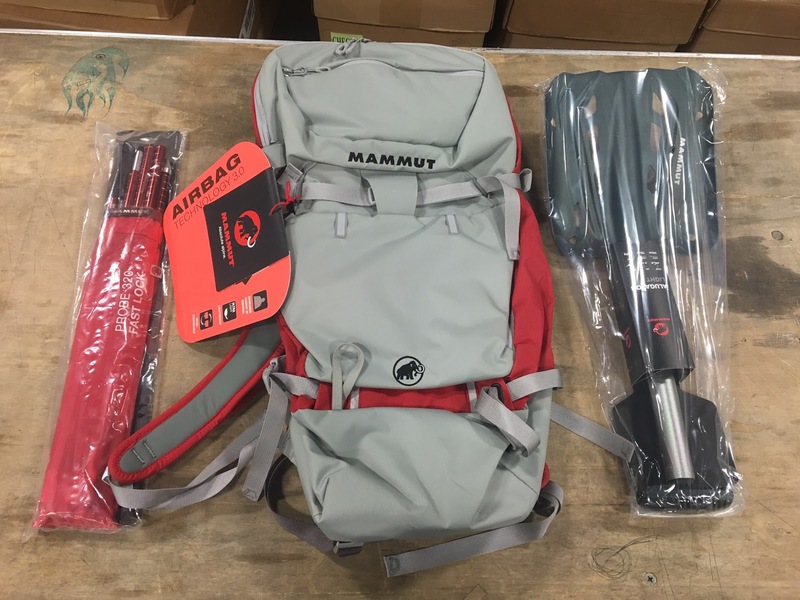 The Light RAS, weighing in at only 5lb 6oz ready to ski (weight includes the North American refillable cylinder), still has several convenience-features, including a zippered internal pocket for shovel, probe and other safety gear that fits most smaller and medium-size shovels. It has a secondary goggle and accessory pocket on the top lid, as well as one zippered pocket on the hipbelt and an internal sleeve for water bladder or other items. We hope this explanation is helpful for those who are looking at this pack, if people have questions feel free to leave a comment below and we'll try to update this post to answer questions within a few days. The front of the pack, next to a shovel and probe for size. 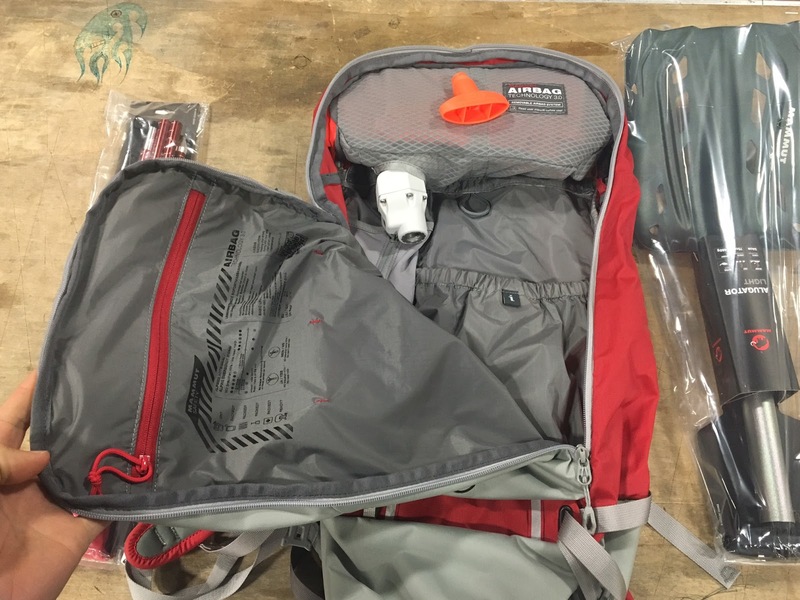 It's a 30l pack, size is measured without the airbag installed--a airbag and full North American cylinder takes up 2.2l of space in the pack, leaving about 28l of usable space. The back panel is molded so it sheds snow. Back length should fit most adults, from about 16.5 or 17" back length up to very long. Here you can see the zippered pocket on the hipbelt for stashing a camera, slope-angle tool, or other items you want easy-access to while riding. Inside the main compartment is the airbag itself. The trigger and ventouri mechanism is on the left, and the cylinder zips inside the stretchy sleeve to keep it unobtrusive and protected. There is a small pocket against your back for a water bladder or for seldom-used items you want easy access to (crystal card, first aid kit, etc). The zippered internal shovel/probe pocket is visible inside the front of the pack in my hand. The zippered shovel/probe pocket has minimal dividers to keep your probe and shovel handle from shifting too much. The pocket is deep-enough to zip most T-grip shovel handles, probes and saws inside. 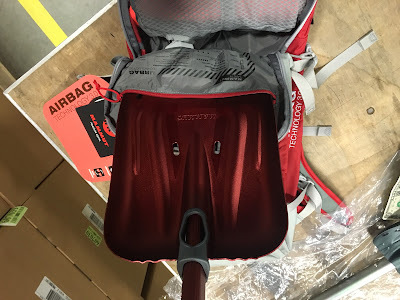 Especially long shovel handles and some D-grips may require leaving this internal pocket unzipped, but the pack itself will zip closed over them fine. 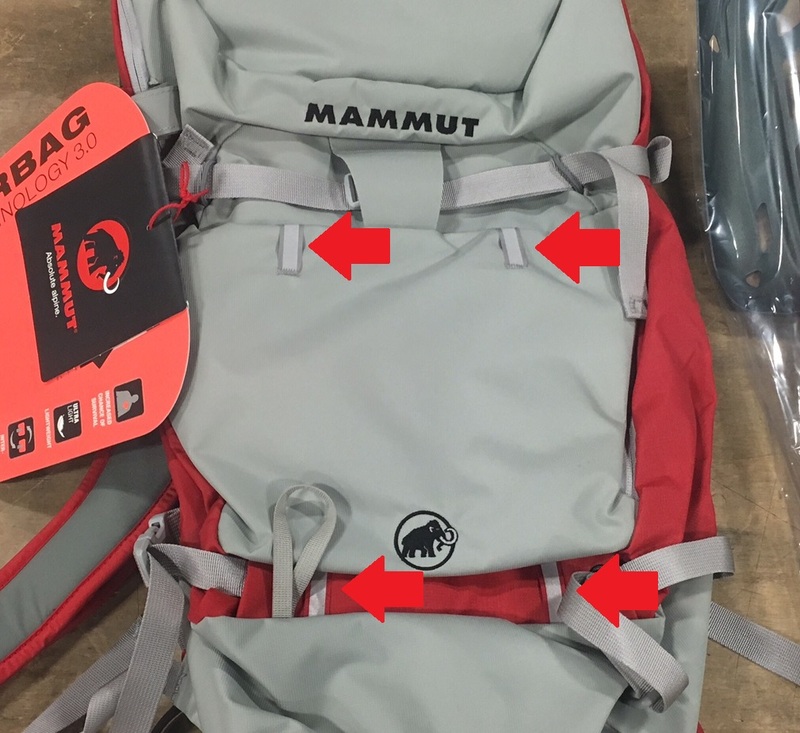 The shovel pocket zip is snug on Mammut's largest shovel blade (1.5" deep x 9.25" wide x 11" long). Especially large shovels from other brands may not fit, but most smaller and medium-sized shovel blades will fit fine. The zip accessory pocket on the top lid has room for goggles or glasses, snacks, sunscreen, skin wax or other items you want easy access to. The ski-carry straps are shown by the red arrows. On the bottom, the side-compression straps adjust the length of this strap to fit any width ski, even super wide powder skis or skinny skimo boards. On top, the compression strap secures the skis. The top strap and a bottom strap supplied by the user can carry a snowboard or split board. For those who prefer a external helmet carrier, Mammut makes an inexpensive aftermarket "helmet holder" (LINK) that secures to virtually any pack, even other brands. The 4 daisy-chain loops shown by the red arrows work perfectly for this, or they are helpful for attaching a bungee-cord, or user-supplied straps for crampons or other equipment. Yes! Great and detailed pictures. Photos with skis (and snowboard) attached to the backpack would make this post perfect. Hello, just a quick question: is it possible to get into bag if the skis are attached? It seems that when the skis are attached with compression straps, there is no way how to get in to the bag (the zip cannot be opened). Am I right? Thanks! The top zip is still accessible--it's more or less like the other zip-opening packs I've used in this regard, i.e. it's not nearly as easy as you might like but it's possible if you need to shed a layer, etc. Great review! Thanks. One thing to add- I bought this pack this season (2018/19) and I've found it very easy to secure my snowboard without an extra strap. It seems Mammut thought of this because if you 'unclick' the two bottom, side straps they will fit into each other along the back to secure a board, though I do add extra security with my ski strap but that is probably overkill.